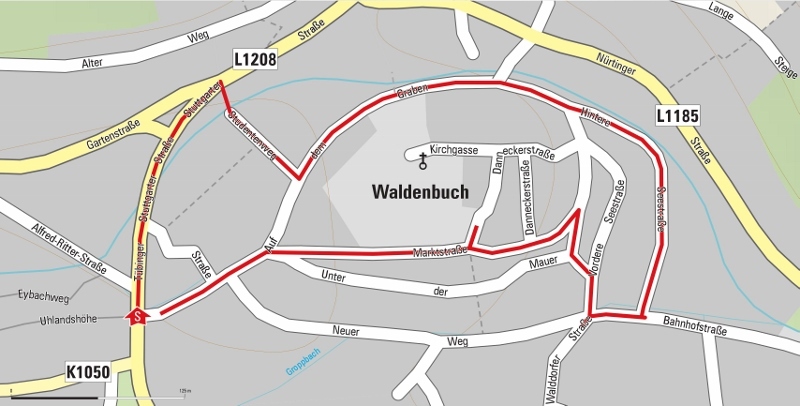 In honour of the 2013 jubilee year "650th Anniversary of the Württemberg Town of Waldenbuch", citizens and local organisations sponsored a total of 22 information boards to commemorate historical events and personages closely associated with Waldenbuch's past, which were set up at prominent places in the centre of the town and its districts. Eleven such stelae can be found in the town centre, nine others in the various outlying communities. The short circular walk shown in the flyer takes in all eleven stelae in the heart of town. Some of them you have to look for, however, as not all are immediately recognisable. Additional information can be found in the flyer, which is obtainable free of charge in both Town Halls. Here (715.2 KB) you can also view the flyer online and download it.